7 Gennaio 2019 – W.A.P. 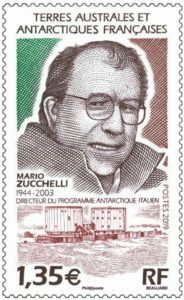 The TAAF (Terres Australes et Antarctiques Françaises) will shortly issue a stamp dedicated to the Italian scientist Mario Zucchelli (1944 – 2003), for years a reference figure for the Italian Antarctic Program. In particular, the TAAF celebrate its important contribution to the realization of the French-Italian Concordia Station (WAP MNB-Ø3), depicted in the stamp along with the portrait of Zucchelli on a tricolor background. In 2004 Mario Zucchelli was also dedicated to the Italian Antarctic Station in Baia Terra Nova (WAP ITA-Ø1).